Our friend Dave turned 30 this week. We celebrated over the weekend with beers, pizza and other fun (including owning the jukebox) at one of his favorite bars, Map Room, and are going to be heading down to Cincinnati soon for some more fun. Since there will be a few of us making the trip to Cincinnati, I decided to bake some goodies to bring along the way. And since it’s his birthday, what better excuse to make birthday cake balls, or birthday cake truffles (which sounds way classier than balls). If you have a birthday coming up – or just want to enjoy some cake batter balls yourself – I highly recommend you make these. They are awesome. They taste like cake batter. And have no eggs. Seriously – if you like cake batter, you must make these right now. I only hope they make it to this weekend and I don’t end up enjoying them all before then! Cream together butter and sugar. Add vanilla. Add cake mix and flour and combine thoroughly. Depending on consistency, add 4-5 tablespoons of milk. Batter should be the consistency of dough so that you can form small balls with your hands. Stir in sprinkles and evenly distribute with your hands or a spatula. Roll dough into small, one inch balls and place on a foil- or parchment paper-lined cookie sheet. Chill dough balls in refrigerator for 30 minutes or freezer for 15 minutes. While dough balls are chilling, melt white chocolate chips in the microwave with Crisco. Microwave on high for 2 minutes, stirring every 30-45 minutes until melted. Once melted, add cake mix, stirring well to ensure a smooth consistency. Using a toothpick or fork, dip cake dough balls into the melted chocolate and shake off excess chocolate by tapping bottom of fork on the side of the bowl. Place completed cake dough ball on the cookie sheet and top with sprinkles. Repeat until all balls are done. 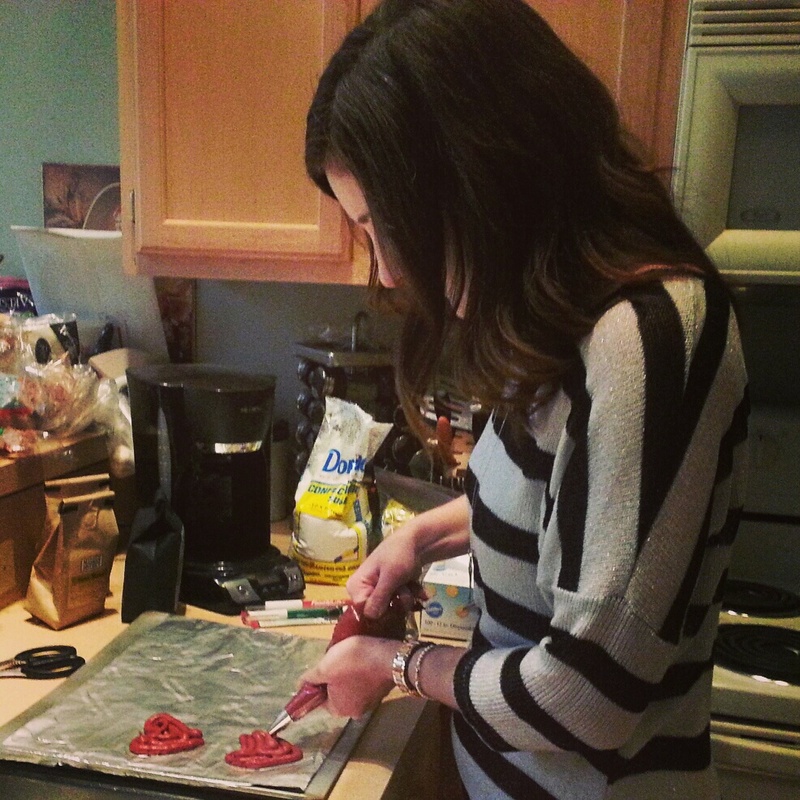 Last minute Valentine’s Day dessert – Red Velvet Heart Sandwich Cookies! “Do you have any Valentine’s Day recipes?” my coworker, Cari, asked me the other day. Did I have any Valentine’s Day recipes? I almost laughed- I had about a bazillion pinned and about a gazillion more in my head (and a few on here). I was dying to make all of them, too! But I couldn’t. Despite reallllly wanting to make a Valentine’s Day dessert, I had just made cupcakes for our Mardi Gras gathering and was hesitant to add more sugar to my fridge (we may have 2 cupcakes left) or bring to the office. So when Cari asked if I thought she could just cut one of the recipes I had shared with her in half, I somewhat jokingly suggested we bake together and split the recipe between the two of us. And she said yes! 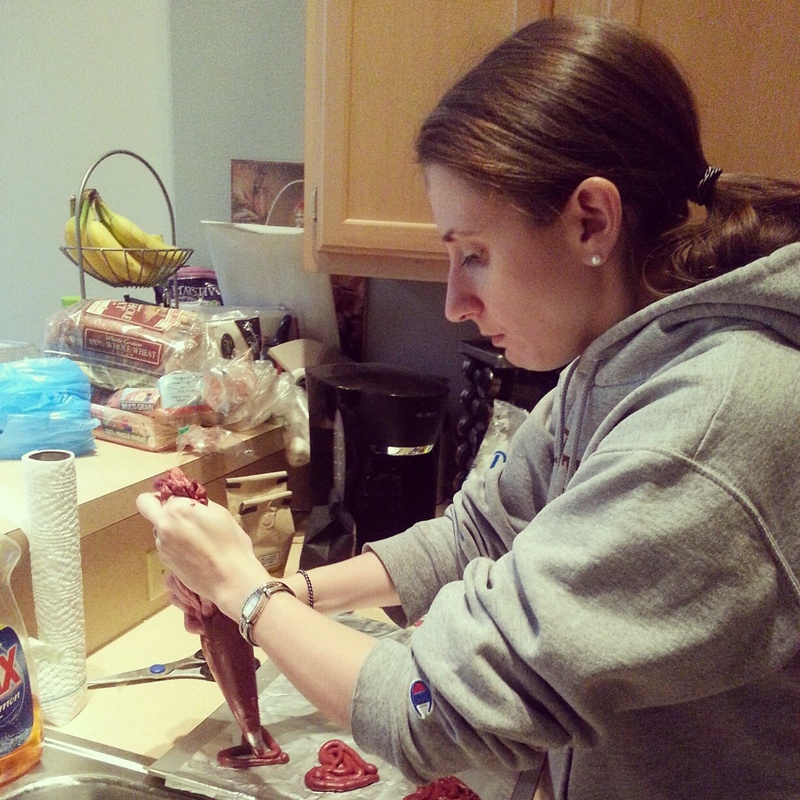 I didn’t know what to do – I don’t typically bake around other people. Sure, B’s usually in the room watching TV or reading, and at home my parents are somewhere nearby, but there are few times I actually bake with someone. I don’t mind it – but I’m a very messy baker, and not that accurate (I hardly ever measure vanilla … or other things), so my baking style sometimes shocks and scares others. Was it messy? Yes. Were my hands, the counter top, and more, covered in red batter, powdered sugar? Perhaps. But was it a success? Yes. The cookies came out delicious (although not whoopee-pie like, like the original recipe, but thus the name change), Cari’s boyfriend was excited, and I have quelled my baking itch for another day or so. AND Cari has said she’ll bake with me again, so I really can’t be that scary, right? Preheat the oven to 375˚ F. Cut yourself a heart template from cardboard or card stock. 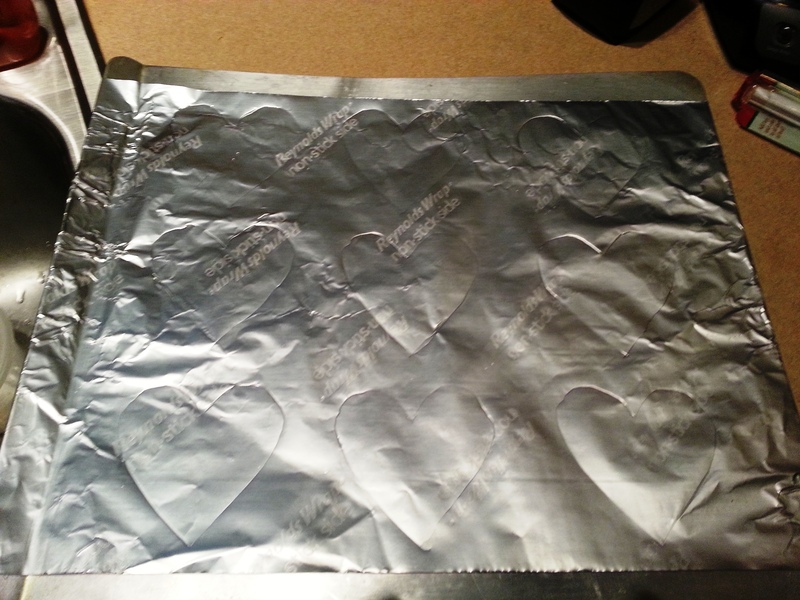 Trace the template/stencil evenly spaced onto pieces of parchment paper or nonstick foil to fit two cookie sheets. In a medium bowl, whisk together flour, cocoa powder, baking powder and salt. Set aside. If you’re using powdered buttermilk, add the powdered equivalent to this dry mixture. In your KitchenAid or stand mixer, mix the butter and brown sugar on medium until fluffy and creamy. Beat in the egg (or Egg Beaters) and vanilla. If you’re using powdered buttermilk, add the 1/2 c water (or whatever the buttermilk box tells you) at this time. Turn mixer on low and slowly incorporate dry ingredients about a cup at a time. Do not overbeat. Blend in the food coloring. I used two full little containers of food coloring gel and probably could’ve used more. Using a spoon, move batter to a piping bag fitted with a large round tip. 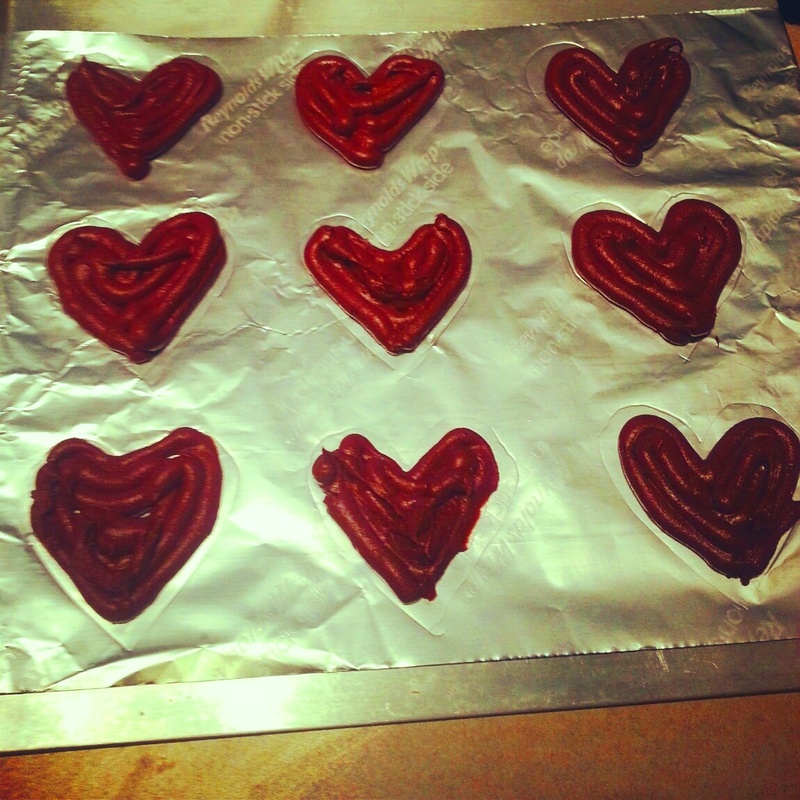 Pipe the batter onto the foil hearts. Bake 8-10 minutes and cool for 4-5 minutes on baking sheets before transferring cookies to a cooling rack. Allow cookies to cool completely before frosting/filling. I put mine in the freezer to speed up the process. Clean your stand mixer so you can make the frosting in there! Beat the cream cheese and butter on medium until smooth and creamy. Gradually add in powdered sugar until smooth and lump free. After cookies are cool, spread them out and pair them up, placing two hearts that appear the same shape and size on top of one another. Flip one cookie of each pair over so that the flat side is facing up. Make your sandwiches! Using a spoon (or another piping bag, as the original recipe suggests), place a heaping tablespoon of frosting on top of the flat side of the cookie you’d like to be the bottom. Sandwich the cookies together so the flat sides are facing each other and press gently to help the filling reach the edges. You should be able to see a thin white layer of frosting between two cookies. Feel free to sprinkle sugar crystals along the sides to add more Valentine flair. Enjoy! Our recipe made 9 sandwiches (18 cookies) and two mini heart cakes. I have decided to give up eating meat for Lent. I know it will be a challenge, but it’s one that I think I can do and one that will also broaden my cooking horizons. Will B give up meat? No. But he has said he’ll try whatever recipes I come up with, so I’ve already started looking for new vegetarian recipes to try and even taken some books out of the library. So, during the countdown to Lent, I enjoyed some of my favorite meaty dishes, mainly pepperoni pizza and pepperoni bread. And believe it or not, I’ll also miss chicken! That’s why this weekend I decided it was time to make this recipe (pictured below – picture is not mine) that I’ve had for a little while, before my meat-free months begin. If you want an easy, hearty and relatively healthy dish that takes about 5 minutes prep time (but 1 hr 15 min to cook), I highly recommend this. Plus, think of all you can accomplish in the 1 hour and 15 minutes you spend waiting for this dish? You could clean your kitchen, read a book, do some exercises in your living room (I wouldn’t recommend going to the gym while this is in the oven), and more! Think of how productive you can be! At least that’s what I was thinking … B and I ended up just snacking (on pepperoni bread obviously) and catching up on our DVR. Watching episodes of The Office and Walking Dead count as being productive, right? Anyway, the meal turned out delicious and B took the leftovers (I only had one thigh) for lunch today. I don’t usually like dark meat but with the crusty ciabatta bread, olive oil sauce and other ingredients, I managed to eat it, and enjoy it! The recipe below is what I made and it serves 2-3 depending on how hungry you are. The original serves 4-6. Get a deep roasting tray big enough to fit all the chicken in one layer. Rip the ciabatta into medium-sized chunks and place in the tray with the chicken, tomatoes, basil, garlic cloves, olives, chopped red chili pepper. Add a generous drizzle of olive oil, a pinch of salt and pepper and the chili. Toss to mix up well, then reposition the chicken on top. Bake in the oven, turning the chicken after 30 minutes. Cook for another 30 minutes and then add the pancetta on top of the chicken. Return to the oven and cook for an additional 15 minutes, until the chicken is cooked and falling off the bone. Serve with a side salad and perhaps some more ciabatta bread! All the ingredients ready to be roasted! The recipe says to put the chicken on top before roasting but I couldn’t leave you with a photo of ugly naked chicken so I adapted it slightly. My office is celebrating Mardi Gras this week with a Fat Tuesday luncheon and potluck. I thought about preparing some Crock Pot Jambalaya, but really wanted to bring dessert. My cousins are from Louisiana and each year they used to send us a King Cake in New York via mail. I looooved the King Cake – it was cinnamony, flaky colorful and had creamy frosting. I looked up a few King Cake recipes and thought about making one – but with a relatively small office, it seemed like it’d be too big to prepare. 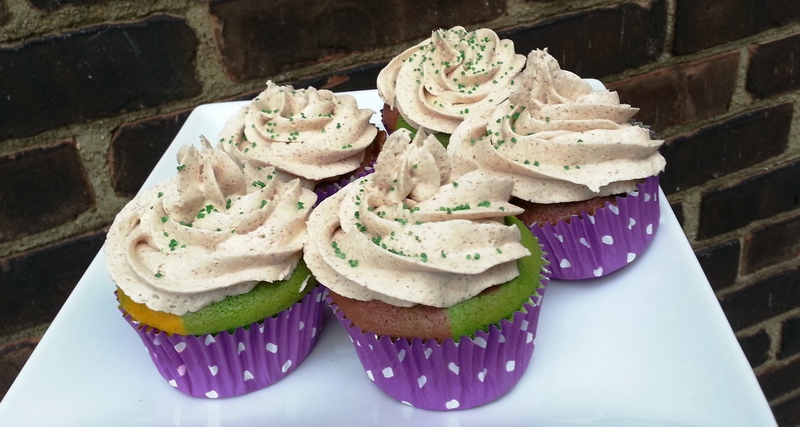 Then I realized – I could make Mardi Gras cupcakes! Of course! These aren’t quite King Cake – they’re not flaky or bread-like – but they are fun colors, have creamy frosting and cinnamon. And B (a chocoholic) more than approved of them – he even asked if I could leave him some at home! Line muffin tins with cupcake liners. Mine made about 17 cupcakes. Use an electric mixer to beat together all the cake mix, buttermilk, vegetable oil, eggs and cinnamon on high speed. Mix well so batter isn’t lumpy – especially if you use powdered buttermilk like I did. Divide the batter equally into three parts in three separate bowls. I had probably about a cup of batter in each bowl. Using food coloring, create one batter bowl green, one batter bowl yellow, and the third batter bowl purple (I mixed blue and red food coloring). Get a tablespoon for each color batter. Start with one color and take a spoonful of batter. Push batter up against one side of cupcake wrapper. 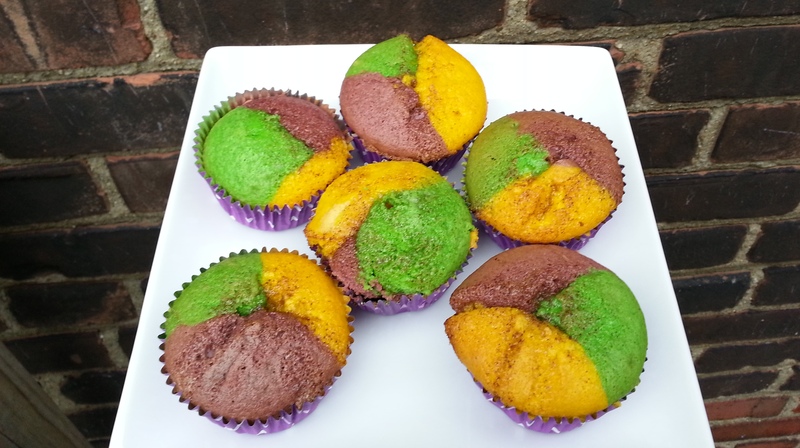 Fill in with the other colors, using the same technique, pushing batter up against other sides of cupcake wrapper until you have the green, purple and yellow batter in thirds in the cupcake wrapper. Don’t worry about making these perfect, they will still taste great! Bake for 18 to 20 minutes (or what the box says), until toothpick comes out clean. Frost when cool. Beat butter with an electric mixer until fluffy. Add powdered sugar, ½ cup at a time, beating well until completely combined. Add the milk, 1 tablespoon at a time until frosting is creamy and thick. Mix in vanilla and cinnamon until well combined. Fresh out of the oven – check out the colors!